July 15 was a special day in New Hampshire Motor Speedway’s history: the first time NASCAR visited the Magic Mile. 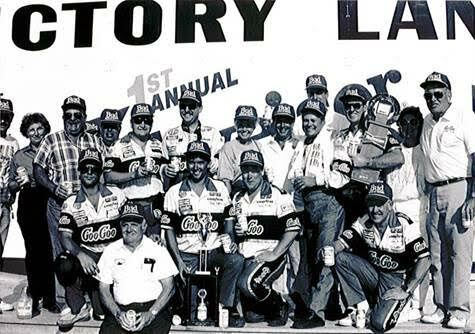 That was exactly 25 years ago today, a race won by Tommy Ellis in the inaugural Budweiser 300, a race in the Busch Grand National Series (now known as the XFINITY Series). This unforgettable moment is No. 3 on New Hampshire Motor Speedway’s top-10 moments of all-time as it celebrates 25 years of racing at the Magic Mile. It would be the 22nd and final victory of Ellis’s career. Ellis still ranks 12th in the series’ all-time wins column. Ellis, who led on three separate occasions, was one of 12 drivers to lead the Budweiser 300, taking the lead for good when he passed Mike McLaughlin on Lap 244. Ellis was the first of 23 straight different XFINITY Series winners at New Hampshire, a streak that ended in 2010 when Kyle Busch won for the second time in his career. Great seats are still available for the 2015 Oxford Casino Season of Speed at New Hampshire Motor Speedway, with the NASCAR Sprint Cup Series 5-hour ENERGY 301 right around the corner on Sunday, July 19. To purchase tickets please call the NHMS ticket hotline at (603)783-4931 or visit www.nhms.com. I was at that race, it took something like 4 hours to run, what a long day. Saw some excellent Modified and Busch North races in the following years, though.